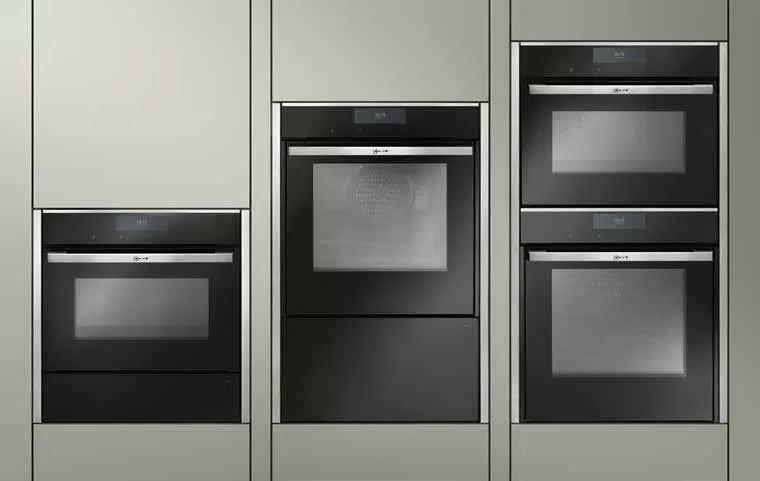 How big should your new oven be? Do you need it to be self-cleaning? Do you really need a steam oven? Should it be an internet enabled oven? Buying a new oven for your beautiful new kitchen can be very confusing! There are so many factors to consider and so many types of oven, so we’ve put together a guide to take you through all of the key considerations you need to make when buying a new oven. Your precious new oven should ideally last you over 10 years, so you want to make sure that you’re making the right choice and that it doesn’t quickly become out dated. Moreover, it’s important that it fits your cooking needs perfectly, you should never settle for an oven which doesn’t meet your needs, you’ll only regret it later. Today’s latest ovens come with a plethora of helpful features, but you need to ensure that your oven does the basics well, the last thing you want is to make the easy tasks a real chore. OK, so let’s grab our oven mitts and open the door on the steamy world of ovens (all puns intended). Most traditional ovens have two static heating elements, either on the top and bottom or the sides, these are fine for cooking oven meals, but you’ll need a fan oven for perfect all-over baking. You’ll find fan cooking in most modern ovens, these don’t feature heating elements in the top or side, instead they have the heating element in a separate compartment which heats up the air. The heated air is then blown over the food using the fan, the real question is: how well does the oven do this? You need to be looking at how the air flows through the oven, this will tell you how evenly your food will cook. If you’re a diehard baker, you may also want the ability to switch off the fan and return to using the heating elements when required. This can be ideal for cooking crispy pizza bases or crusty pastry cases. Grilling is another cooking option that is often overlooked. It’s easy to get caught up in the main oven cooking capabilities, but when you’re in need of that grilled cheese on toast at 10pm one night, you’ll regret not having it. Most ovens still come with grill functions, but there are a few that do not, so have a long and hard think about whether this is critical for you. Steam cooking is another capability that you’ll need to carefully consider. In recent years, there has been a significant increase in the popularity of stream cooking, largely for its health benefits. However, most steam cooking units sit on your countertop taking up valuable worktop space, but this is your opportunity to put steam cooking in a more convenient place in your kitchen. It is worth considering steam carefully though, these ovens tend to have a smaller capacity and will either need to be plumbed into the mains or have their own water tank (which you’ll need to fill up constantly). 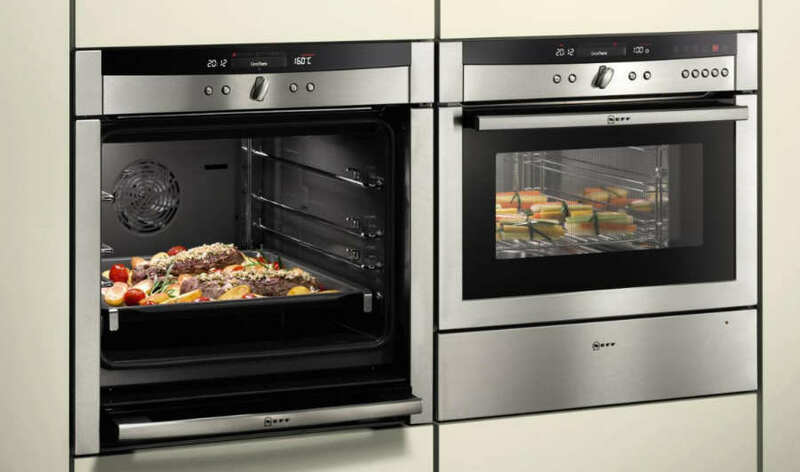 We rely on fat and oils to keep our food moist, so could a steam oven help take your cooking to the next level? Making your meals more succulent, not to mention healthier. Essentially, when it comes to built-in ovens you have two options: single oven or double oven, if you go down the freestanding route then you’ll be happy to hear that you can find an oven in any size you need. Built-in ovens need a little bit more consideration, you first need to consider very carefully where you need your oven to go, that will be the important factor for your options. With a built-under oven, which fits underneath your worktop, you have the option of a single oven with large capacity, or two small ovens in a double-oven format (usually around 72cm tall). However, if you decide to place your oven at waist to shoulder height, you can have any oven that takes your fancy. You can either go for one or more single ovens, or you can go for a large sized double oven (usually around 90cm tall). It all depends on your kitchen plans and how much room you have in your new kitchen. 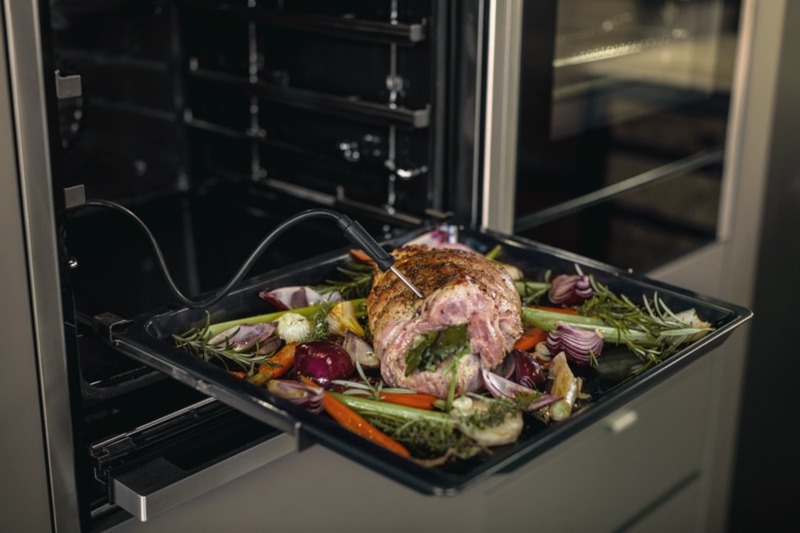 Think about how many roasts you’re likely to be cooking, and how many people you usually cook for on a daily basis, this will tell you how many ovens you many need to use simultaneously and how big they need to be. It’s also important to consider whether you need to leave space for other accessories, such as a coffee machine, built-in microwave or a warming draw. Plus, ensure that you double check the precise external dimensions of the oven you’re looking at, these measurements can vary slightly between the different manufacturers. Manufacturers generally quote the internal volume in litre units, but as it’s unlikely you’re going to be filing it with water, this isn’t particularly useful. You can’t use the entire space to cook with, and the inside layout of the shelves can determine how much of the space is usable, it’s important to look at the internal layout and dimensions of the oven. Larger capacity numbers doesn’t always correlate to more cooking space! Pyrolytic cleaning: This program on your oven heats the oven to an incredible 500°C, any grease or residual oils in your oven is incinerated to a crisp. Once the oven cools down again, all you have to do is wipe out the ash. Now for those of you that worry about safety, there are pyrolytic cleaning ovens which lock the oven door whilst it goes through the program. This is a great option for the environmentally conscious as no harmful chemicals are used. As pyrolytic cleaning becomes more mainstream, the prices are coming down, but be sure to do your research and find out the feature comes highly rated on the oven you’re considering. Catalytic liners: These can be found at the rear, sides and sometimes roof of your oven. Instead of using heat to remove the residual oils and grease, these liners gradually absorb and break it all down, this is done by specialist chemicals within the liners. You’ll need to run a specific cleaning programme on your oven every month or so, this will heat the oven up to a temperature allowing the liners to work their magic. Steam cleaning ovens: These are a less common option and involves adding water which then creates steam to loosen the burnt-on grease. However, you will still have to get your hands dirty and clean all surfaces inside the oven with a damp cloth. Easy clean enamel/nano-cleaning surfaces: These are surfaces which repel grime, meaning that when you come to clean your oven you can simply wipe it clean. Depending on which surface you go for, it can work out cheaper than the other oven cleaning features. Whichever option you go for, make sure you read user and professional reviews so that you can find the solution that works for you. Some ovens have pyrolytic cleaning that doesn’t work very well, in which case, you’d have been better to save your money. There is an almost endless number of oven options, sizes and manufacturers, it’s enough to leave your head spinning with the choice. So, we wanted to make your life slightly easier and give you two brilliant options for you to consider. Digital controls – These digital controls are simply more accurate than the dials you have on traditional ovens, enabling you to get exactly the temperature you need, perfect for high precision baking. They also make the oven look nicer, well in our opinion anyway. Programmable timer – No, we don’t just mean a timer that will beep when the time is up, we mean timers which will turn your oven on at a set time and turn your oven off after a set time. Some ovens even let you set these timers 24 hours in advance. Slide and hide doors – This is a patented NEFF oven feature, it enables you to slide the door of the oven underneath the main oven unit, giving you closer access to your oven. This is a great feature to have if you have a small kitchen, meaning you’re not tripping over the oven door. Telescopic runners – It’s often awkward and cumbersome taking food in and out of your oven just to check whether it’s done, this is made much easier with telescopic runners. These are easy slide arms which allow you to simply pull the whole shelf towards you, giving you easily accessible and stable access to your food. There is nothing worse than spending hours cooking a meal only to drop it when you’re taking it out of the oven! Steam cooking – We’ve mentioned steam cooking above, but we cannot overstate how good it is. Steam cooking gives you crisp surfaces because as the moisture settles on the food, it evaporates, this causes the surface to crisp up while the inside remains moist. It’s not only for cooking vegetables in a healthier way, but all sorts of cooking, it’s perfect for cooking bread and roasts. There are some ovens which are ‘full steam’, for cooking food in an intense stream environment, but you may also want to consider a Variosteam from NEFF. The Variosteam ovens add moisture to the cooking, but are not anywhere near as intense. 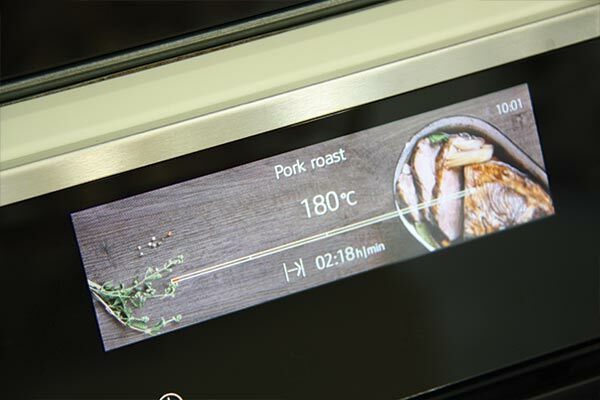 Internet connected/’smart’ ovens – This is still very much a feature that is reserved for the top ovens, but some brands such as AEG, Bosch and Siemens have models available that allow you to control certain functions, or check on cooking progress using an app on your smartphone or tablet. For example, Siemens Home Connect app allows you to start, change and end cooking programmes remotely, as well as keeping tabs on other kitchen appliances. AEG even has an oven with a camera inside, allowing you to check progress without needing to get up from your chair. Automatic cooking – This takes the hard work out of cooking the basic dishes. All you have to do is set the dish, temperature and time needed to cook, the oven will do everything else for you. Some ovens now even come with a recipe option where all you have to do is set which dish you’re cooking and it’ll do the rest for you, even telling you which shelf to put the dish on. Built-in thermometer cooking – so often when you’re cooking meat, you constantly need to pull it out and prod it with a thermometer to see if it’s done. Instead of setting the timer for your oven, you simply set the temperature you want your meat to get to and insert the thermometer into the meat, the oven then turns off once your meat is at the perfect temperature. Imagine never over-cooking your meat again! Modern ovens are incredible, they come with so many features that can make your cooking easier and more fun. It can be bewildering when considering which oven to buy, there is an almost endless number of manufacturers and models out on the market. We hope that we’ve armed you with the information that you need to go and find your perfect oven, or at least given you some things to think about to help you on your journey. Ensure you read the reviews, both professional and consumer, to find out which ovens are worth the money, and just because an oven has some high-end features doesn’t make it worth the money. Some budget ovens might not be all they seem. Sometimes it might be worth spending that little bit more and going for an industry leader such as Bosch, NEFF or Siemens. If you need more help choosing the right oven for you, please contact us on 01279 504230 or email info@designerkitchensforless.co.uk. Your Guide To Coffee Machines – Which one is best for you?Your Guide To Coffee Machines – Which one is best for you?